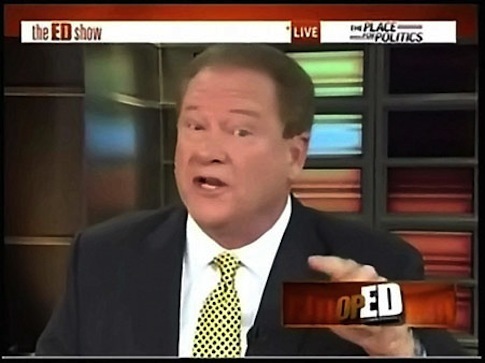 Ex-MSNBC host Ed Schultz, newly hired by the Kremlin-funded propaganda network RT America, did a segment in 2014 blasting Russian president Vladimir Putin on his "nasty" human rights record and reckless behavior. Schultz also hit conservatives for "rekindling their love affair" with Putin in the clip. RT America announced Thursday that Schultz, who was let go by MSNBC in July, would start hosting The News With Ed Schultz on Jan. 25. RT, or Russia Today, has been described as the Russian government's propaganda network by the Columbia Journalism Review, and it features heavily anti-Western viewpoints that prompted one of its anchors to quit on the air in 2014, saying she could no longer work at a network that whitewashed Putin's behavior. Less than two years ago, Schultz derisively referred to him as "Pooty" on his bombastic liberal MSNBC program The Ed Show. In the "Pretenders" segment, Schultz would generally go after conservatives for what he viewed to be silly, misleading or hypocritical behavior. In the Aug. 27, 2014 edition, Schultz played a clip of Fox News host Kimberly Guilfoyle suggesting she wanted Putin to be president of the U.S. for 48 hours because of his strong leadership. "Guilfoyle says that if Pooty were in the White House, ISIS would be gone over the weekend," Schultz said. "George Bush thought he could stamp out terrorism easily, too, and how’d that work out?" Schultz then played a montage of conservatives who allegedly "fawn" over Putin, including Rudy Giuliani and Sarah Palin. Their statements, however, were more about criticism of President Obama then praise of Putin. "Let me remind all conservatives on alert out there who are rekindling their love affair with Vladimir Putin of the facts," Schultz said. "He oversees a nasty human rights record, he violated a weapons treaty and lost international trust. His reckless behavior led to sanctions hindering Russia's economy. Pooty can’t lead our country. He’s too busy crippling his own." RT made headlines in 2014 for its clear pro-Putin bias as it covered Russia’s invasion of Ukraine. Former host Abby Martin was a 9/11 truther who accused Israel of employing Hitler’s methods. The network also employs conspiracy theorists. This entry was posted in Culture and tagged Ed Schultz, MSNBC, Russia, Vladimir Putin. Bookmark the permalink.